IKEA Holiday Soft Toys Campaign Runs November 4 – December 29 Supporting UNICEF and Save the Children Educational Programs in 40 Countries. IKEA Soft Toys which are going to make a perfect gift for anyone this holiday season. 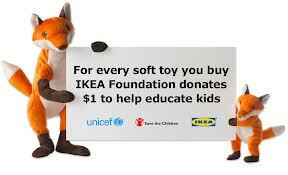 And for every IKEA Soft Toy or children’s book you buy, the IKEA Foundation donates $1.00 to education programs worldwide supported by UNICEF and Save the Children. Let’s all get involved by picking up your own IKEA Soft Toy for someone in your life this holiday season. Not only are you getting a special little someone an amazing gift, you’re going to help children around the world. You can purchase IKEA Soft Toys From there wide selection of Soft Toys stretching in prices from .40 cents to a little over $14.99 (how cheap is that!?). My little Sophie just adores her IKEA Soft toys, but I’ll tell you, these little critters are just for the kiddos! Think about the pet in your life that loves to toss around a stuffed toy! I know my Harley girl loves a good soft toy she can play and snuggle with. Yes, Harley is my dog, she is spoiled rotten and she loves stuffed animals! Go look at IKEA’s large variety of Soft Toys and pick the right one for you or someone in your family. They won’t be disappointed this holiday season when they get to cuddle up to there new IKEA Soft Toy with a smile. Giveaway! Kodak Easyshare Digital Camera (WW ~ 12/18) | Cotton Ridge Create! I love IKEA and this is awesome of them to do this for the children!! What an awesome campaign–I love when companies do things that allow you to touch someone in your life and someone you don’t know at the same time. It’s a great way for everyone to get involved in spreading “cheer”. Way to go, Ikea! 🙂 Thanks for sharing about this!! We love IKEA! Just earlier this year we bought new living room furniture from them. Yes thank you for this info on IKEA toys, never bought one before but sound like good toys. These look WONDERFUL for children!! I’ve always wanted an Ikea here because you have awesome products! Thanks for the education. I had no idea Ikea made anything but furniture. These toys look very safe and great! What a nice way to give back. Thanks IKEA. I love when I can buy something & do some good at the same time. This would be perfect to buy for Toys for Tots, then you are doing 2 good things at a time. This is such a nice thing they are doing, yay Ikea! Those animals are just adorable…I love that they are for education ! I love that part of the sales proceed go to a GREAT cause! I know my 2 year old grandson would love the KLAPPAR ELEFANT soft toy and it’s only $14.99! These are adorable! I have purchased a few soft toys from IKEA before and they’re huge hits with my nieces. I love that money is being used for education, too! Thanks for the info on this I think this a great idea! Also a great idea to get extras and give to local police and rescue so they have some when needed. IKEA toys are great, this is a great opportunity for giving back to the community. This is a great idea both for children and for the donation they make when you purchase. Unfortunately it wouldn’t work for our Olde English Bulldog named Max as he loves to destroy and eat toys. Aww I love this!!! I plan on purchasing a few soft toys this year as gifts. Such a neat thing you are doing!!! IKEA has really good quality products. Soft toys my niece loves and my two dogs love stuffed animals too. I love IKEA! This is a great campaign to raise money especially this time of year. Those toys are so cute! I love those soft toys because they are safe even for little children and it’s a nice thing that buying one will help you give back to the community. These are so cute, my granddaughters would love to open one of these Christmas morning! Love, love, love them! 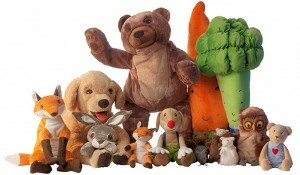 These soft toys are unique and interesting, and will bring hours of enjoyment to children. 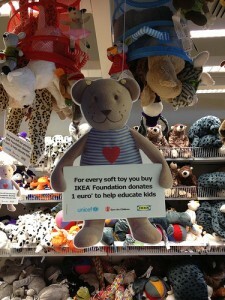 my kiddos like IKEA Soft Toys and this is a great idea for the donation they make when you purchase.